Jessica Simpson at the Frederick’s of Hollywood Benefit for Clothes off our Backs. Jessica wore a black dress from What Comes Around Goes Around, teamed with her beige Christian Dior peep toes, which seem to be a bit of a fave for Jess at the moment. Heidi Klum at the launch of her Victoria's Secret Make-Up range. The German supermodel, wore Miss Sixty jeans and a Cecilia de Bucourt top, for the event and showed off the golden cased beauty products, which all bear her face or signature. The stunning Cecilia de Bucourt silver Gladiator top is on-line at manhattanite.com, costing $168.00. For more info on Heidi's make-up, which includes Mosaic Eyeshadows and lipsticks, see the Victoria's Secret site. The make-up range is just another addition to Heidi's fashion and beauty empire, joining her shoe line, jewelry range and perfume. Mary-Kate and Ashley Olsen attending an event at Neiman Marcus, to launch their new clothing line, Elizabeth and James. While MK stuck to the Olsen's signature color - black - Ashley took a leaf out of Victoria Beckham's book and donned some zingy orange, for a fresh new look. Attending the Fendi fashion show Kate Bosworth stole her look right off the runway, wearing almost exactly the same fur jacket, shorts and tights outfit as model Natasha Poly did in the Fall 2007 Fendi show. The stars were out on Saturday, as the Spike TV Scream 2007 Awards took place in LA. Megan Fox wore a bombshell style red dress, paired with some YSL leopard print shoes, and picked up the award for Best Action Actress. Hayden Panttiere appeared in a teeny gold mini dress, and Jessica Alba wore a stripey dress by Corey Lynn Carter, teamed with black tights and some Prada booties. Paris Hilton also appeared and opted for an all black outfit - suspender belts and all. Mary-Kate and Ashley Olsen at the opening of Jenni Kayne's store. Ashley wore a black tunic top, with wide grey pants and some petrol blue pumps, then added a real color boost with a Fendi purse. Mary-Kate decided on a black mini, with a huge wide belt and some patent Christian Louboutin heels. Catherine Zeta Jones and Michael Douglas at the A Fine Romance Benefit, in LA. Catherine kept her reputation as one of Hollywood's reigning queens of glamor, as she appeared in a long emerald green gown by Reem Acra, and wore her long raven mane up, in a classy high hair do. As they new face of Di Modolo jewelry, she did the company proud, wearing a number of stunning jewels by the design house. And completed her glam look with silver shoes by Brian Atwood and a matching silver clutch by Mary Norton. Uma Thurman was stunning as she appeared on the red carpet for the Swarovski Fashion Rocks concert in London. The show's presenter for the night wore a rhinestone covered black tulle gown, from Valentino's final collection, which showed of her 6ft body to perfection. Keeping with the Swarovski theme of the night, Kate Moss wore a sparkling silver flapper style dress created by Topshop, which covered with around 60,000 crystals and beads was estimated to cost £40,000. The dress is now being auctioned on Ebay, with all proceeds going to the Prince's Trust. Gwyneth Paltrow gave her own spin to this girly Valentino dress, at the Fashion Rocks event. The actress, who introduced the designer on stage, went for a shorter version and added some edge to the ethereal dress, pairing it with a black blazer and some smoky eyes. Designer Roberto Cavalli - "How many bags and pairs of shoes do you own?" "Countless! You really can’t put a number on that one." Jessica's hairdresser and friend Ken Paves asks - "Do you have a pair of lucky pair of socks you wear under all of your favourite stiletto boots?" "OK, I have a thing about socks. I have a pair of Penguin socks that I bought at Hot Socks at an airport — I don’t remember which airport. And they’re lucky. I’m weird about socks. And I also have people draw on my socks, and I save them and wear them if I want some luck." Ashlee Simpson asked - "What is your fave thing about having a younger sister?" "Oh, that is funny. My favourite thing is that she is cooler than me. I go to my sister for advice all the time, mostly about guys, life or how to deal with an argument with Mom or Dad. You’d think she was older. I had to go through life first, and she saw the choices I made, good or bad. She can look at my life and be, like, ‘OK, I’m gonna do it this way.’ I might be a little more jaded, but it’s exciting for me to see her making good choices." 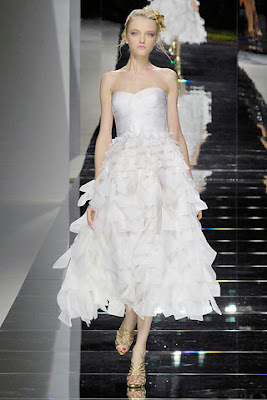 Jessica's cover dress is by Isaac Mizrahi. Inside she also talks about her diet and fitness plan, which she worked on with Harley Pasternak, to get fit for Major Movie Star. Eva Longoria complimented her gorgeous, glowing skin tone in a lilac Oscar de la Renta creation, as she attended a Vogue magazine event, in Mexico. Eva was stunning in the strapless gown and added even more eye catching touches with her sparkling Rene Caovilla heels and H. Stern necklace. Some candid snaps of Kate Moss out and about with her daughter, Lila. Kate wore a striped jumper, and jeans from Siwy, teamed with some black Ray-ban shades and flat jazz style shoes. Emmy Rossum was a little over dressed, but beautiful none the less, when she wore this Christian Dior Haute Couture gown to the Skin Sense Awards. The dress has previously been seen on Dita Von Teese, who wore a lilac shade version, while Emmy wore the catwalk's pink jeweled design, minus the fine belt. It's always one of the biggest talking points in the run up to the Victoria's Secret Fashion Show - Who will get the Fantasy Bra? Heidi Klum has worn the diamond bra in the past, and last year it was Karolina Kurkova who got the honor, now this year it's Selita Ebanks. And lucky Selita isn't just getting a million dollar bra, she's getting a full lingerie set, including a blinged out garter and thong, featuring a festive holly design. Victoria's Secret model Marisa Miller is the cover girl for November's issue of Fitness Magazine, and with that body it's easy to see why. Q - How do you prepare for the Victoria Secret show? "For the five days leading up to the show, I train with my boxing instructor, Phil Paolina. We do different punch combinations - jabs, hooks, uppercuts - and combinations that include ducking, which incorporates squat-like moves for my legs. We do this in the ring for 10 rounds - each round is three minutes and I get a one-minute break in between, during which I do as many crunches as I can. Q - As a model, do you follow a specific diet? "I try not to eat carbs for dinner because I don’t like to sleep on a full stomach. In the morning I’ll have an English muffin or Ezekiel bread, which is all grains and legumes, with protein in it too. If I’m really good, I’ll make an omelet with vegetables. And cheese - I have to have cheese in there somewhere. For lunch and dinner, I eat protein, like tuna and a spinach salad. I don’t change my eating routine for the show, I just follow this plan a little more strictly. This article is a little old now since the magazine is for August, but it's an interesting one none the less. While Jessica Biel may have graced the cover it was another feature inside the August issue of Russian Cosmopolitan that was the interesting one. Stars of music, film, TV and sport all posed in their black bikinis and went photo shop free, speaking about how they keep in shape and deal with any pressures or insecurities. First was TV star Alla Dovlatova, who said she struggled with her weight after having children but got back into shape through sport, training and proper nutrition. Ex-gymnast and now TV personality Svetlana Khorkina had some quite philosophical views, stating "It is most important to understand : if someone has bad taste or stereotypes, this is not your problem. Each woman God created man, remember this simple truth. " Ice Skater Irina Slutskaya states that sport not only helps to give shape but also enhances the mood and says "If people live in harmony with oneself, it is truly beautiful. " And actress Anastasia Kochetkova says that an active life gives a good impression as well as a great physical shape, and says "Do not forget sport, whatever shape you are, moderate exercise will always be of benefit." Kate Moss spotted out at a news agents. Along with her fab boots and colorful scarf Kate wears Superfine jeans and a jacket by Rag and Bone. Catherine Zeta-Jones was unveiled last week as the new face of jewelry designers Di Modolo. She wore a purple strapless dress by Gustavo Cadile to the event, teamed with silver accessories and a few select pieces by Di Modolo. The Di Modolo campaign, featuring Catherine, will make it's debut in the November issues of multiple top fashion magazines, including Vogue and In Style. 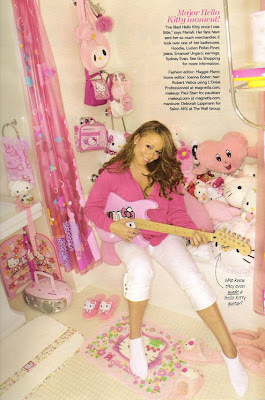 Mariah Carey brings a large dose of pink to the November issue of Glamour magazine as she appears on the cover and inside gives a peak into her super luxurious home and closet - which includes a whole ton of Louboutin shoes, and there's also a bathroom filled with super cute Hello Kitty items, which Mariah says was sent to her over the years by fans.